More photos from my week at the coast...Dave and I climbed out on some rocks to take these photos and I love how the came out. You can even see some of the surf spray across the photos as the wave almost hit me. What you do for good photos ey? I have a busy week ahead with looking at wedding venues, blogger dinners, wedding fairs & dinners with friends. All fun things so I cant wait! The place is really amazing. Lovely photos and such a beautiful location! Love the beach. Your wee wellies are cute!! These photographs are so lovely and your outfit is adorable! You are such a cutie! Adorable little boots, so pretty! What STUNNING pictures! I especially love your wellies! Can't wait to start hearing all about your wedding. lovely photos. I just want to teleport to that location immediately. It looks so relaxing. this coast is so idyllic and pristine, in love. As ever, gorgeous photos and AMAZING wellies! Such a cute outfit - love the location! These are great "on location" photos! Great photos, love you boots so much. I love this outfit! 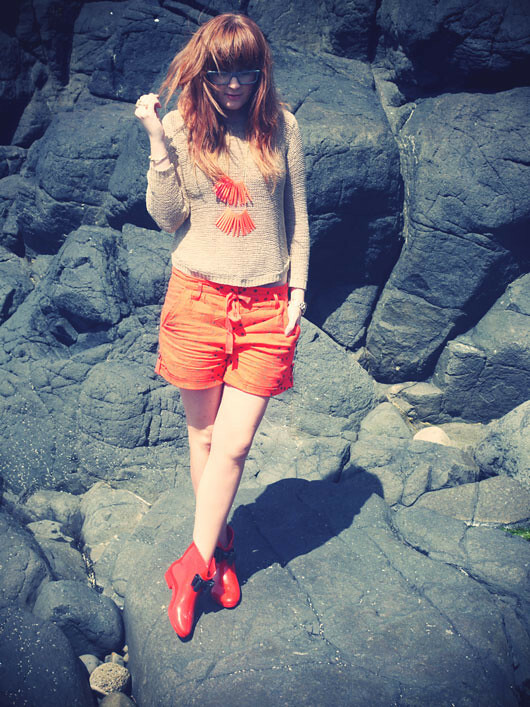 The orange shorts and accessories look amazing together! I love how you pull of colour so well, I'm always a bit weary if I go too bright as it can often attract some stares! Love the little wellingtons, I was after a pair like this to go over and watch the bf's matches! Awe the things we do for style shoots! Lovely background and great necklace! -JB.